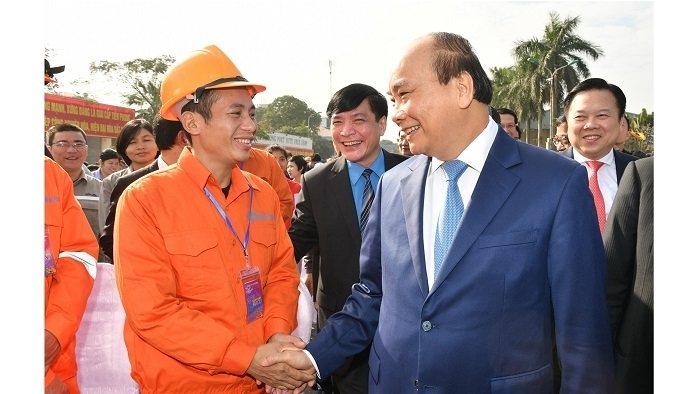 "Tet is the time to care for the disadvantaged and all social strata, so that everyone, including workers, is happy to welcome the Lunar New Year," PM Phuc said while attending the 2019 Tet gathering with workers of Hai Phong Port JSC this morning. For many years, the "Tet gathering" program has been well organised by the Vietnam General Confederation of Labour, helping to bring a festive Tet to workers nationwide. It features various practical activities to take care of workers, especially those in difficult circumstances on the occasion of Tet. On behalf of the Party and State leaders, PM Phuc sent his best new year greetings to all workers in Hai Phong city, wishing them a warm reunion with their families during Tet. The PM affirmed that the comprehensive achievements in the country's socio-economic development in 2018, with multiple socio-economic targets reaching and exceeding the set plan, is an important basis for the country to have more resources to care for and improve the lives of policy beneficiaries, as well as to promote social security, national defence - security and development investment. He hailed the Vietnam General Confederation of Labour for organizing activities to care of trade unionists and employees, especially those from disadvantaged backgrounds and social welfare families. He expressed his wish that, in the following years, all trade union members, workers and employees in the port city would continue to strictly abide by labour discipline, and strive to improve their professional qualifications and productivity, thereby contributing significantly to the development of their units and the country as a whole. On the occasion, Prime Phuc presented over 200 Tet gifts to trade union members and disadvantaged workers in the city. Earlier the same day, the government leader had a working session with the city leaders, during which he conveyed his Tet wishes to the municipal authorities. 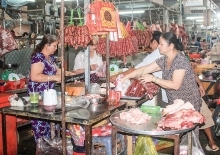 He extolled the city for fulfilling their socio-economic development plans for 2018, as Hai Phong led the country in the gross regional domestic product (GRDP) growth, at 16.27%, the highest level so far and 2.3 times the nation’s average level (7.08%). The local economic structure was much better with the establishment of several high-tech agricultural parks, while all communes in Hai Phong were recognised as new rural areas. The city also took the lead in industrial production, especially in automobile manufacturing. 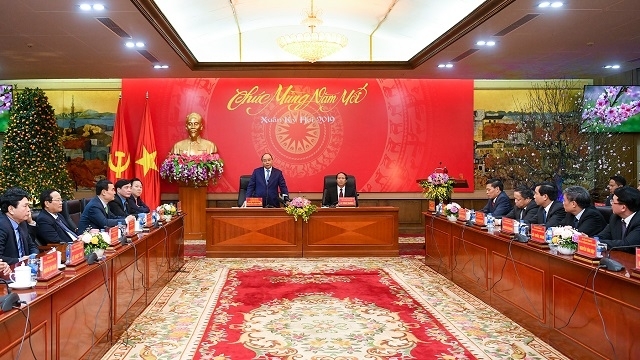 These outcomes have laid an important foundation for Hai Phong to set higher targets and make stronger strides in the future, PM Phuc said, suggesting that the city promote social investment for further development.